If we're being completely honest though... I bet what you are REALLY wondering is how you can make rose gold icing. That's okay that you're not completely obsessed with my life and current Netflix bingeing lists. I'm alright with that. We can still be friends. I'm just not going to give you the first ride on my new pony that my other friends are certain to bring me at any moment now. Hope that's okay. 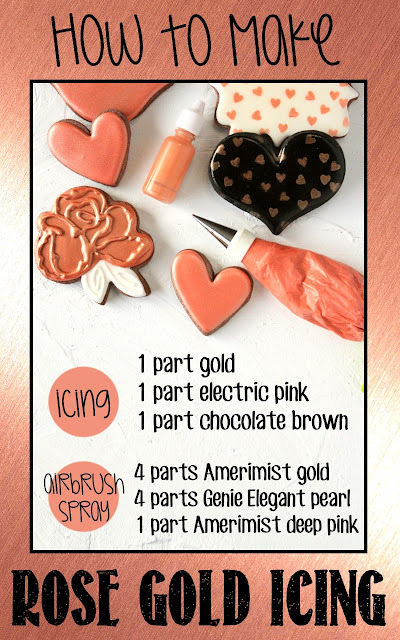 But I WILL tell you how I made this rose gold icing AND the rose gold airbrush spray that completely matches even though the ratios will make you think they are two completely different colors. If you need more help understanding how ratios work when mixing icing colors CLICK HERE for a detailed post. 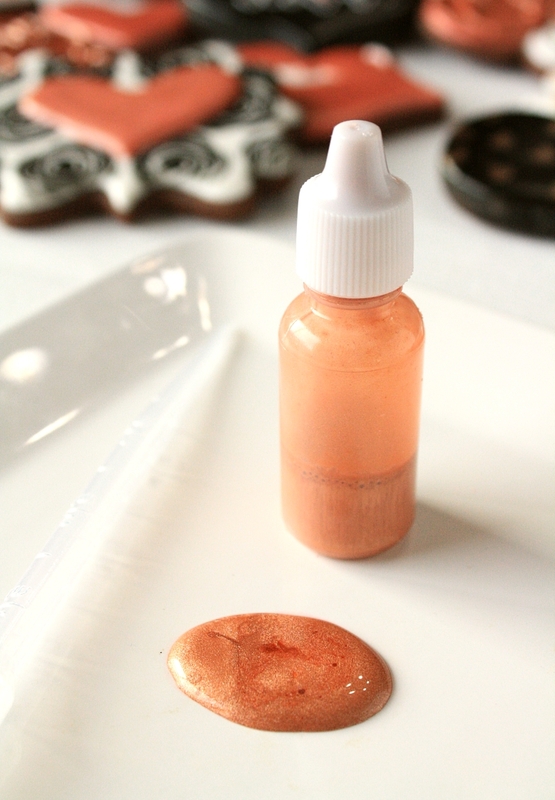 And if you are NOW wondering if you need to make both rose gold icing AND rose gold airbrush spray....the answer is...do what you want. I know I do. 🙂 The airbrush spray WILL cover white icing. It doesn't cover black icing so well though. I put two light layers on the white cookie and seven light layers on the black cookie. Get the food colors: GOLD, ELECTRIC PINK, and CHOCOLATE BROWN. Get the airbrush colors: GOLD, PEARL, and DEEP PINK. Get the other supplies: PLASTIC DROPPERS and DROPPER BOTTLES. 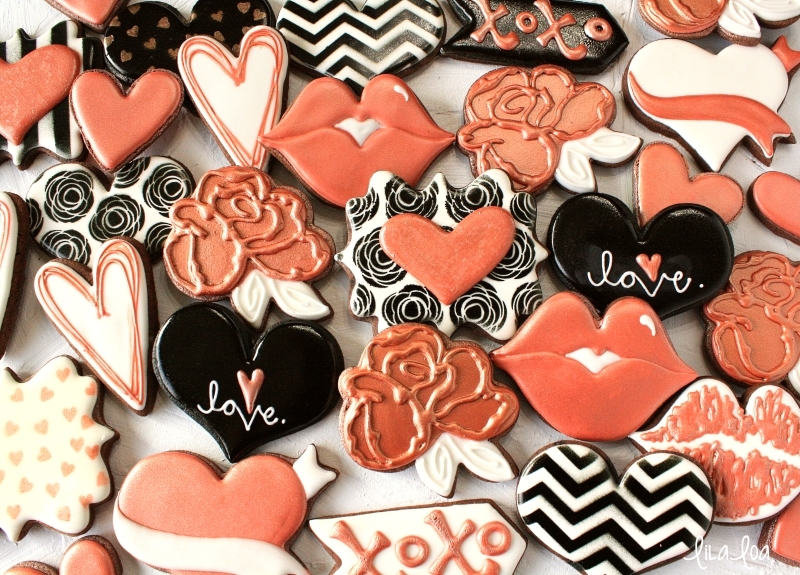 Get the cutters: ROSE, TALL HEART, CHUBBY HEART, LIPS, PLAQUE, BANNER HEART, and CHEVRON ARROW. See how I made the ROSE COOKIE HERE.